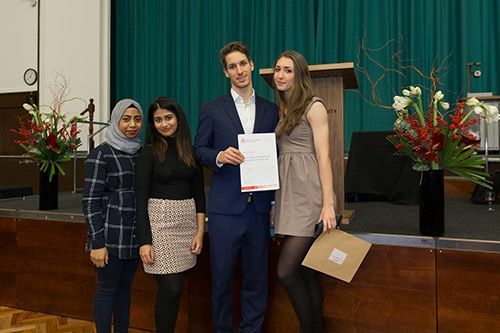 Current students and recent graduates were awarded prizes for outstanding academic achievement at The City Law School’s Prize-Giving ceremony in the Great Hall on December 1st. 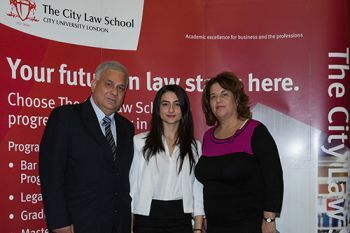 The City Law School (CLS) celebrated the outstanding achievement of its current and graduating students with a prize-giving ceremony on 1st December. The event took place in the Great Hall. 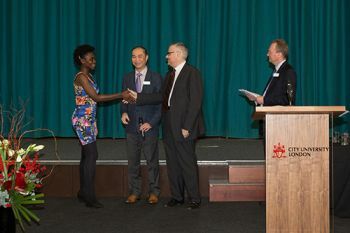 CLS Dean, Professor Carl Stychin, Professor Jason Chuah and Professor Peter Hungerford-Welch, were on hand to present prizes and congratulate the awardees on their accomplishments. To view photos of prize-winners during and after the ceremony, please visit this weblink. The Legal Practice Course (LPC), also known as the Postgraduate Diploma in Legal Practice is the final vocational stage for becoming a solicitor in England and Wales. The course is designed to provide a bridge between academic study and training in a law firm. It is a one-year, full-time (or two-year, part-time) course. The course is usually taken after a law degree, but a large minority take the course after studying a different subject at university and taking a conversion course called the Graduate Diploma in Law (GDL/CPE). The LPC is regulated through the Law Society of England and Wales.